Jewellery Software is specially designed for cater the needs of jeweller. Master Product,Barcode,Lot,Dealer,Gold Smith,Customer,Accounts,Chit Transaction Sales,Old Purchase,Purchase,Order,Repair,Chit, Manufacturing,Accounts Reports Sales Report,Old Purchase Report,New Purchase Report,Stock Report,MIS Report,Cashier Report,GST Report,Chit Report Features SMS,Multi User Bill,Web Interface,Mobile Access,Dealer Module,Bullion Module,Whole Sale Module etc..
We have Software for every business. 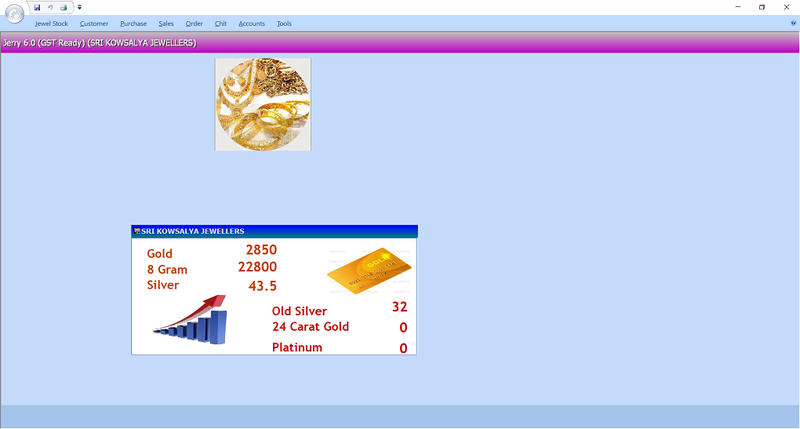 Jewellery Software!